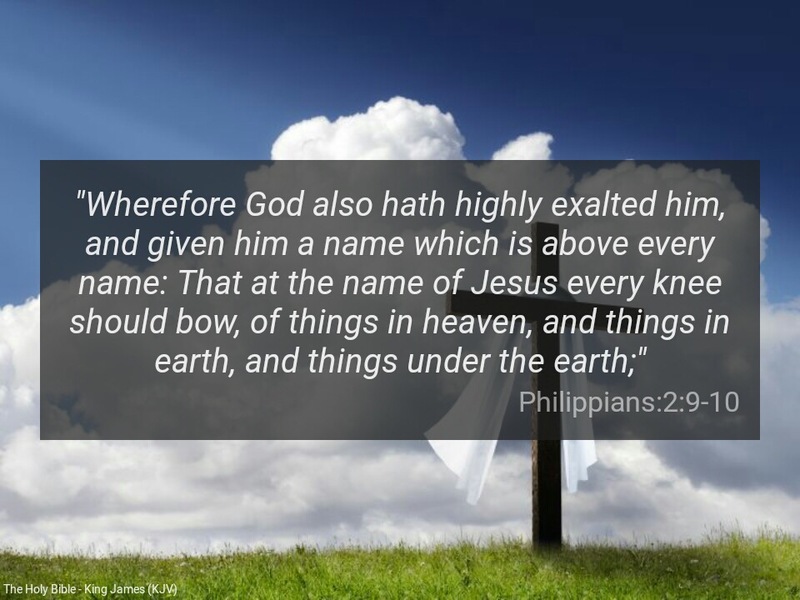 “Wherefore God also hath highly exalted him, and given him a name which is above every name: That at the name of Jesus every knee should bow, of things in heaven, and things in earth, and things under the earth” (Philippians 2:9-10). JESUS is a name above every other name, universally. When the name Jesus is mentioned appropriately by someone in Good Standing with the name, every knee, power, force, authority, principality etc, should bow, whether in heaven, on earth, or underneath (Phil 2:10). All true Christians have new names: sons of God (John 1:12); word of God (Rev 2:17) etc. However, these glorious names are hidden from many, until they persevere and are willing to search the scriptures and discover them. The book of Proverbs says: ‘It is the glory of God to conceal a thing: but the honour of kings is to search out a matter’ (Prov 25:2). God sowed Jesus, as a seed so that He will have many sons in the image and likeness of Jesus. The plan of God is for us to live like Jesus here on earth. Again, Brother Paul revealed this to us vividly in his letter to the Romans: ‘For the earnest expectation of the creature waiteth for the manifestation of the sons of God’ (Romans 8:19). Unfortunately, many born again Christians do not fully appreciate their new status in Christ Jesus. That every true believer is a son of God is a measure of tremendous amount of love from God. Hence, Brother John, writing from inspiration, says: ‘Behold, what manner of love the Father hath bestowed upon us, that we should be called the sons of God: therefore the world knoweth us not, because it knew him not’ (1John 3:1). Brother Paul truly tapped into the anointing and power in Christ Jesus, so much that his handkerchiefs were healing the sick (Acts 19:2). He made us to understand that the kingdom of God is not merely in words but in power: ‘For the kingdom of God is not in word, but in power’ (1Cor 4:20). If you are a Christian in good standing with Jesus, everything contrary to the plan and purpose of God in your life should bow. This could range from ignorance, pride, stagnation, poverty, to illness, disease, fear, doubt and unbelief etc. Every challenge that we have, has a spirit behind it. Every spirit has knees. If every knee is not bowing to the Jesus in you, be open and honest with yourself, and carry out self-examination. Identify the hindrances and aggressively flush them out! His eyes are too pure to behold evil (Habakkuk 1:13). Christianity without POWER is a mere empty religion. We thank God for the fire that is currently spreading across his church. Ignorance has kept many away from enjoying their birth right. Sincerely spend quality time daily to meditate on the word of God, and you will begin to see the difference in your life. Be totally obedient to the word of God. Live your new name in Christ Jesus! Do not limit God through your thoughts! Daily make use of the power in the name of Jesus! Dear Father, please give us the grace of understanding of the the power in the name of Jesus. Amen. There is someone reading this message, may you receive the grace of increasing knowledge of the power in Christ Jesus , and to live your new name for others to see, in Jesus mighty name. Amen. Previous Previous post: Word for Today: There is power in expectation. Next Next post: Word for Today: Let us Pay Attention to Jesus Christ’s Teachings.